I was struck by something Joe Morin told me when I was interviewing him for a story about his in-plant’s new flatbed printer. “Over the years, as we’ve seen print volumes begin to shift downward, we’ve viewed wide-format as an area for continuous growth and an opportunity to add value to our organization,” said the manager of Production Printing at Colorado Springs School District 11, when we chatted on the phone. Both of these things are true for in-plants around the country. Print volumes are going down for types of work that have traditionally kept in-plants busy. Forms, newsletters, manuals, directories — no matter how much we understand the value of printed pieces versus a digital message, customers keep ordering fewer of them. 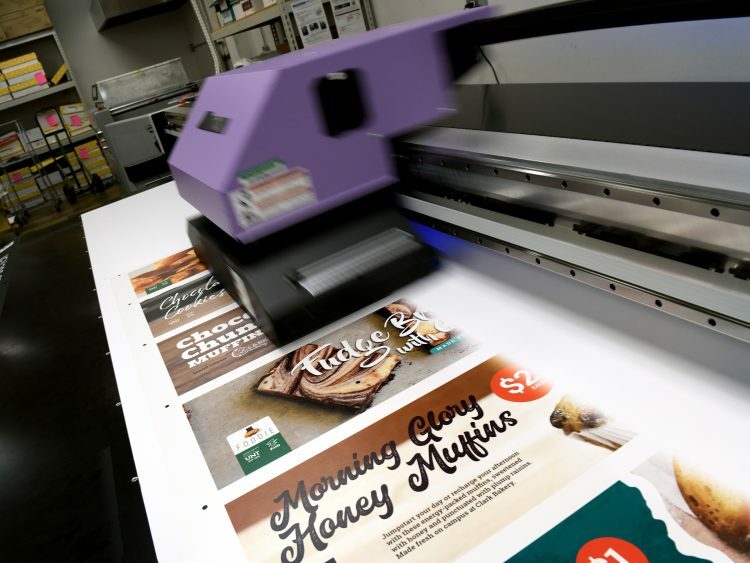 At the same time, those in-plants that have started producing wide-format projects beyond simple posters and banners have discovered a gold mine. Not only are the margins higher than what they’re used to on brochures and business cards, but customers are actively looking for new wide-format applications to order. When they see a gallery wrap hanging in a coworker’s office, they want one in theirs too. A sign printed on clear plexiglass with a 3D effect? That would look great outside their door as well, they reason. Wall and window graphics are a big hit, and customers who never thought about such things before are suddenly excited to have their own walls decorated. The influx of innovative wide-format projects is certainly influencing customers and creating new business for the in-plants that can produce such items. Already 72% of in-plants have at least one wide-format printer, and nearly three-quarters report that their wide-format volume has grown over the past year. At a third of in-plants, volume has increased more than 10%. That’s what I told the crowd at the in-plant breakfast we organized during the SGIA Expo in Las Vegas, citing data from a new IPG research report, “Equipment Investment Trends in the In-plant Industry.” That breakfast session included a panel of three in-plant managers who showed off unique applications their shops have produced. The fact that almost none of the attendees tried to slip away after downing their breakfast and instead stayed until the very end to participate in the conversation shows just how interested in-plants are in new wide-format applications. The SGIA Expo was, in fact, an excellent place to get ideas for new applications and ask questions about the variety of new substrates on the market. I spotted a good number of in-plants doing exactly that. Next year, when this event transforms into PRINTING United, it will be even more expansive, with production printing and other technologies added to the mix. It will be the perfect venue to get ideas for new applications your in-plant can produce to add value to your organization. This idea of expanding into new markets (i.e., convergence) has taken hold in the industry, as printers of every type look to adjacent markets to expand their businesses. In the in-plant world, where wide-format printing has long been popular, “convergence” means expanding into new applications and services. To help in-plants share their ideas, we plan to hold several free breakfast and lunch sessions at PRINTING United. So keep the dates on your 2019 calendar: Oct. 23-25, in Dallas. In the meantime, we plan to keep you informed about new applications in-plants are producing that demonstrate this convergence trend. Our story this month on how the in-plant at Regional Health is using wide-format to aid in the patient healing process is the first of our “Convergence Stories.” Let me know if you have an example of your own to share.